Developing for the Internet of Things hinges on the ecosystems, doesn't it? In most IoT use cases you'll want Wi-Fi for remote control and access to cloud resources like storage, compute, analytics and dashboards. You'll use Bluetooth 5 low energy (BLE) to connect sensors and to set up mesh networks covering large numbers of Things. Those are very different wireless networking technologies and ecosystems you'll have to accommodate. How many different radios will it take to meet your product requirements? And how are you going to cobble them together? The QCA4020 from Qualcomm Technologies, Inc. (QTI) is a multimode SoC designed to support multiple wireless technologies and ecosystems on a single chip. Now available in affordable development kits and modules, the QCA4020 offers high concurrency and data throughput over separate radios for dual-band 2.4/5GHz Wi-Fi and Bluetooth low energy (BLE) v5.0. Plus, to make sure your products are ready for lower-power networks, the QCA4020 covers 802.15.4, supporting ZigBee 3.0 and Thread via OpenThread. Zigbee 3.0 — Built on the IEEE 802.15.4 standard and Zigbee PRO specifications, Zigbee 3.0 adds additional layers for security plus an application framework to allow mesh networking of hundreds of devices on a single network. Developers can use Zigbee 3.0 to build an interoperable, full-stack solution for lighting, security, climate control and smart home applications. QCA4020 software development kit (SDK) is currently certified for R21 platform specifications and also supports RF4CE, home automation and building automation profiles. Thread — Also based on IEEE 802.15.4 standard, Thread features low latency, low power consumption and high interoperability in blended networks. Thread is well suited to battery-operated or sleepy devices that need to be connected to the network. With a complete stack that includes support for IP routing and 6LoWPAN, QCA4020 is Thread-certified for OpenThread v. 1.1 and can be used in any of the Thread classes of devices including border routers, joiner routers and end devices. AWS IoT cloud — Besides linking devices like smart appliances, sensors and microcontrollers to the Amazon Web Services (AWS) Cloud, AWS IoT provides interfaces you can use for controlling those devices from mobile phones and tablets. You can also collect, store and use the data from IoT devices in the AWS Cloud. 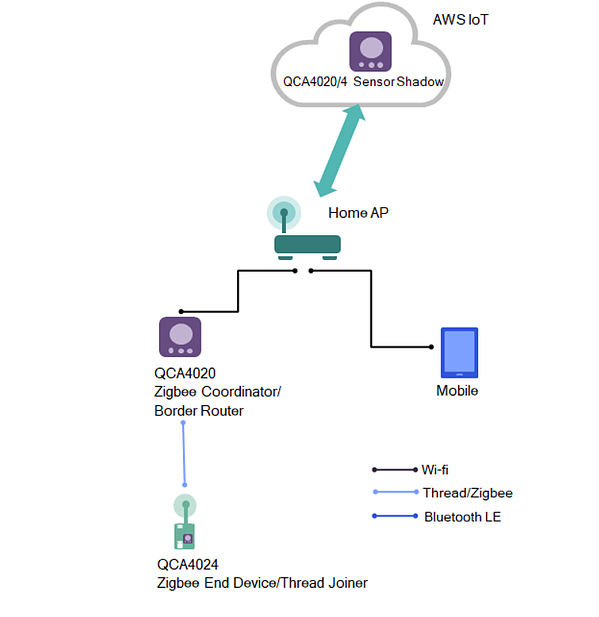 The diagram below illustrates a ready-to-run demo app included with QCA4020; a mobile app uses AWS IoT to connect with the chip through sensor shadow running in AWS Cloud and receives sensor data (e.g., temperature, pressure, humidity, counter increments) from devices running on a Zigbee network. Azure IoT cloud — Similarly, Azure IoT is made for connecting IoT devices and making their data available through the Azure cloud. Using the QCA4020 SDK, applications can integrate sensors and mobile apps to send data to the cloud and allow users to analyze it on a mobile phone or in a browser dashboard. BLE mesh networking — Connecting BLE network nodes to IP networks is a common scenario for lighting, home comfort, remote control, home security and industrial applications. Qualcomm Bluetooth mesh is designed to allow BLE devices to send and receive messages, act on received messages and repeat those messages to nearby devices. The mesh technology helps extend the range of BLE networks. With a sample app built into QCA4020 to help control lighting and provision a mesh network (illustrated below), the chip can bridge BLE mesh networks to Wi-Fi-connected devices and IP networks. In summary, this single, highly concurrent SoC covers multiple wireless technologies and ecosystems and provides very capable IoT devices. With that kind of ecosystem coverage, you can focus on developing your product instead of paging through catalogs to find obscure devices and a sufficiently versatile chip to connect them. In this and several upcoming blog posts, I'll walk you through QCA4020 and the options it opens up to you in ecosystems, cloud connectivity, security, Bluetooth 5 (BLE) and radio concurrency. You've got the IoT use cases. We help you access the most important ecosystems. One of the most compelling use cases is the embedded IoT hub that accommodates multiple, concurrent connections in Wi-Fi, BLE and 802.15.4 ecosystems. It is applicable to both consumer and industrial scenarios. As shown below, a thermostat equipped with QCA4020 acts as IoT hub. A motion sensor or door lock is connected to the hub over BLE. A person enters the house, which activates a light switch or smartplug over Wi-Fi. The hub receives temperature-related messages from room sensors over the BLE (or 802.15.4) mesh network. The homeowner can also provision or control the thermostat directly from an app running on a mobile phone. Over Wi-Fi, the thermostat sends temperature data to the cloud (AWS IoT or Azure IoT). The IoT hub can run up to 10 concurrent BLE or 802.15.4 (Zigbee or Thread) connections with mobile devices, sensors and Wi-Fi clients. Embedded IoT hub — You can embed QCA4020 in other IoT devices like thermostats and appliances as a hub for bridging ecosystems. For example, you can use it to collect BLE traffic from a provisioning app on a smartphone or tablet. Then you can forward it over an IP network so that it's accessible for cloud computing. As noted above, the IoT hub can bridge among multiple radios (Wi-Fi, BLE and 15.4), it can support the BLE mesh ecosystem and cloud connectivity, and the IoT hub can send data to either AWS IoT cloud or Azure IoT cloud. RTOS gateway — With its on-board ARM Cortex M4F application processor, QCA4020 is powerful enough to run as a separate, low-cost gateway with a real-time operating system. It can fill the same need as the IoT hub, at much lower cost than a hub or gateway running Linux. BLE, Zigbee and Thread mesh — QCA4020 has sufficient RAM and concurrency to connect and move messages among a multitude of devices in Zigbee, Thread or Qualcomm Bluetooth mesh networks. Get your QCA4020 development kit now. And watch for more posts in this series. QCA4020 is a highly concurrent SoC covering your main IoT needs for Wi-Fi and BLE. And, its 802.15.4 coverage gives your products and applications room to grow to standards like Zigbee and Thread. You'll be surprised how much your products can do when they can reach widely varying ecosystems from a single chip. This blog was originally published on the Qualcomm website.